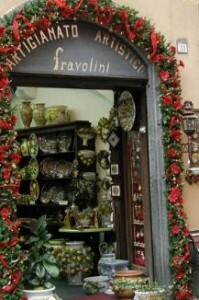 Music and Markets Tours invites you to join us in Orvieto for an unforgettable New Years celebration. The timeless cobbled lanes of this hilltop town will resound with the jazzy melodies of Umbria Jazz Winter from morning until late into the night. Tag along with the procession as a jazz band struts their stuff along the ancient streets, enjoy Orvieto’s noteworthy cuisine and celebrated white wine as we listen to a jazz combo, and celebrate with a music-laced feast as we bring in the New Year. We’ll see how many colorful ceramics from the famed workshops of Deruta we can fit in our luggage, stop by fabulous designer outlets on our way from Florence, and shop the terrific January sales for winter bargains. Discover the unique tastes of the region from wine and olive oil estates and take home samples to remember the journey. Explore vineyard-wrapped villages of Tuscany and little known corners of Florence, enjoying the region’s tempting cuisine at country inns and city trattorias as we go. 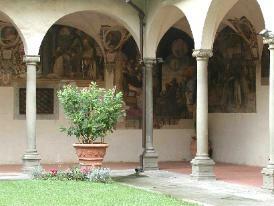 Find centuries-old frescoes in Florence’s hidden corners. Don’t miss this exceptional winter experience! Click here to view superb photos taken by Elizabeth Anderson during the 2007-8 Tour. 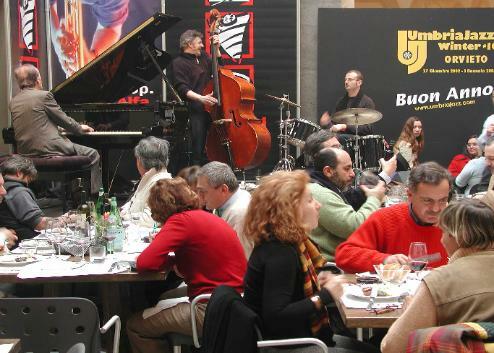 Fun breaks out easily when jazz performers create new grooves in one of Orvieto’s many venues.